Solution phase NMR structure of orexin B based on the PDB coordinates 1CQ0​. Orexin, also called hypocretin, is a neuropeptide that regulates arousal, wakefulness, and appetite. The most common form of narcolepsy, in which the sufferer briefly loses muscle tone (cataplexy), is caused by a lack of orexin in the brain due to destruction of the cells that produce it. There are approximately 70,000 orexin producing neurons in the human brain that project from the lateral hypothalamus to neurons and brain regions that modulate wakefulness. However, the axons from these neurons extend throughout the entire brain and spinal cord, where there are also receptors for orexin. Orexin was discovered in 1998 almost simultaneously by two independent groups of rat-brain researchers. One group named it orexin, from orexis, meaning "appetite" in Greek; the other group named it hypocretin, because it is produced in the hypothalamus and bears a weak resemblance to secretin, another peptide. The use of both terms is now a practical necessity, as hypocretin is used to refer to the genetic products and orexin is used to refer to the protein products. There are two types of orexin: orexin-A and -B (hypocretin-1 and -2). They are excitatory neuropeptides with approximately 50% sequence identity, produced by cleavage of a single precursor protein. Orexin-A is 33 amino acid residues long and has two intrachain disulfide bonds; orexin-B is a linear 28 amino acid residue peptide. Although these peptides are produced by a very small population of cells in the lateral and posterior hypothalamus, they send projections throughout the brain. 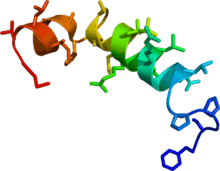 The orexin peptides bind to the two G-protein coupled orexin receptors, OX1 and OX2, with orexin-A binding to both OX1 and OX2 with approximately equal affinity while orexin-B binds mainly to OX2 and is 5 times less potent as OX1. The orexins are strongly conserved peptides, found in all major classes of vertebrates. The orexin system was initially suggested to be primarily involved in the stimulation of food intake, based on the finding that central administration of orexin-A and -B increased food intake. In addition, it stimulates wakefulness, regulates energy expenditure, and modulates visceral function. Obesity in orexin knockout mice is a result of inability of brown preadipocytes to differentiate into brown adipose tissue (BAT), which in turn reduces BAT thermogenesis. BAT differentiation can be restored in these knockout mice through injections of orexin. Deficiency in orexin has also been linked to narcolepsy, a sleep disorder. Furthermore, narcoleptic people are more likely to be obese. Hence obesity in narcoleptic patients may be due to orexin deficiency leading to impaired thermogenesis and energy expenditure. Orexin seems to promote wakefulness. Recent studies indicate that a major role of the orexin system is to integrate metabolic, circadian and sleep debt influences to determine whether an animal should be asleep or awake and active. Orexin neurons strongly excite various brain nuclei with important roles in wakefulness including the dopamine, norepinephrine, histamine and acetylcholine systems and appear to play an important role in stabilizing wakefulness and sleep. The discovery that an orexin receptor mutation causes the sleep disorder canine narcolepsy in Doberman Pinschers subsequently indicated a major role for this system in sleep regulation. Genetic knockout mice lacking the gene for orexin were also reported to exhibit narcolepsy. Transitioning frequently and rapidly between sleep and wakefulness, these mice display many of the symptoms of narcolepsy. Researchers are using this animal model of narcolepsy to study the disease. Narcolepsy results in excessive daytime sleepiness, inability to consolidate wakefulness in the day (and sleep at night), and cataplexy, which is the loss of muscle tone in response to strong, usually positive, emotions. Dogs that lack a functional receptor for orexin have narcolepsy, while animals and people lacking the orexin neuropeptide itself also have narcolepsy. Central administration of orexin-A strongly promotes wakefulness, increases body temperature and locomotion, and elicits a strong increase in energy expenditure. Sleep deprivation also increases orexin-A transmission. The orexin system may thus be more important in the regulation of energy expenditure than food intake. In fact, orexin-deficient narcoleptic patients have increased obesity rather than decreased BMI, as would be expected if orexin were primarily an appetite stimulating peptide. Another indication that deficits of orexin cause narcolepsy is that depriving monkeys of sleep for 30–36 hours and then injecting them with the neurochemical alleviates the cognitive deficiencies normally seen with such amount of sleep loss. In humans, narcolepsy is associated with a specific variant of the human leukocyte antigen (HLA) complex. Furthermore, genome-wide analysis shows that, in addition to the HLA variant, narcoleptic humans also exhibit a specific genetic mutation in the T-cell receptor alpha locus. In conjunction, these genetic anomalies cause the immune system to attack and kill the critical orexin neurons. Hence the absence of orexin-producing neurons in narcoleptic humans may be the result of an autoimmune disorder. Orexin increases the craving for food, and correlates with the function of the substances that promote its production. Orexin is also shown to increase meal size by suppressing inhibitory postingestive feedback. However, some studies suggest that the stimulatory effects of orexin on feeding may be due to general arousal without necessarily increasing overall food intake. Leptin is a hormone produced by fat cells and acts as a long-term internal measure of energy state. Ghrelin is a short-term factor secreted by the stomach just before an expected meal, and strongly promotes food intake. Orexin-producing cells have recently been shown to be inhibited by leptin (through the leptin receptor pathway), but are activated by ghrelin and hypoglycemia (glucose inhibits orexin production). Orexin, as of 2007, is claimed to be a very important link between metabolism and sleep regulation. Such a relationship has been long suspected, based on the observation that long-term sleep deprivation in rodents dramatically increases food intake and energy metabolism, i.e., catabolism, with lethal consequences on a long-term basis. Sleep deprivation then leads to a lack of energy. In order to make up for this lack of energy, many people use high-carbohydrate and high-fat foods that ultimately can lead to poor health and weight gain. Other dietary nutrients, amino acids, also can activate orexin neurons, and they can suppress the glucose response of orexin neurons at physiological concentration, causing the energy balance that orexin maintains to be thrown off its normal cycle. Orexins and orexin receptor agonists can increase alertness like substituted amphetamines, but with fewer side effects. Merck reported at the Sleep 2012 conference that insomniacs taking an orexin blocker, suvorexant, fell asleep faster and slept an hour longer. Suvorexant was tested for three months on over a thousand patients in a phase III trial. Suvorexant has undergone three phase III trials and was approved on August 13, 2014 by the US Food and Drug Administration (FDA) after being denied approval the year before. It is available as "Belsomra". Preliminary research has been conducted that shows potential for orexin blockers in the treatment of alcoholism. Lab rats given drugs which targeted the orexin system lost interest in alcohol despite being given free access in experiments. A study has reported that transplantation of orexin neurons into the pontine reticular formation in rats is feasible, indicating the development of alternative therapeutic strategies in addition to pharmacological interventions to treat narcolepsy. Because orexin-A receptors have been shown to regulate relapse to cocaine seeking, a new study investigated its relation to nicotine by studying rats. By blocking the orexin-A receptor with low doses of the selective antagonist SB-334,867, nicotine self-administration decreased and also the motivation to seek and obtain the drug. The study showed that blocking of receptors in the insula decreased self-administration, but not blocking of receptors in the adjacent somatosensory cortex. The greatest decrease in self-administration was found when blocking all orexin-A receptors in the brain as a whole. A rationale for this study was the fact that the insula has been implicated in regulating feelings of craving. The insula contains orexin-A receptors. It has been reported that smokers who sustained damage to the insula lost the desire to smoke. Orexin-A (OXA) has been recently demonstrated to have a direct effect on an aspect of lipid metabolism. OXA stimulates glucose uptake in 3T3-L1 adipocytes and that increased energy uptake is stored as lipids (triacylglycerol). OXA thus increases lipogenesis. It also inhibits lipolysis and stimulates the secretion of adiponectin. These effects are thought to be mostly conferred via the PI3K pathway because this pathway inhibitor (LY294002) completely blocks OXA effects in adipocytes. The link between OXA and the lipid metabolism is new and currently under more research. Obesity in orexin-knockout mice is associated with impaired brown adipose tissue thermogenesis. High levels of orexin-A have been associated with happiness in human subjects, while low levels have been associated with sadness. The finding suggests that boosting levels of orexin-A could elevate mood in humans, being thus a possible future treatment for disorders like depression. In 1996, Gautvik, de Lecea, and colleagues reported the discovery of several genes in the rat brain, including one they dubbed "clone 35." Their work showed that clone 35 expression was limited to the lateral hypothalamus. Masashi Yanagisawa and colleagues at the University of Texas Southwestern Medical Center at Dallas, coined the term orexin to reflect the orexigenic (appetite-stimulating) activity of these peptides. In their 1998 paper (with authorship attributed to Sakurai and colleagues) describing these neuropeptides, they also reported discovery of two orexin receptors, dubbed OX1R and OX2R. In 1998, Luis de Lecea, Thomas Kilduff, and colleagues also reported discovery of these same peptides, dubbing them hypocretins to indicate that they are synthesized in the hypothalamus and to reflect their structural similarity to the hormone secretin (i.e., hypothalamic secretin). This is the same group that first identified clone 35 two years earlier. De Lecea and colleagues were originally in search of novel genes expressed in the hypothalamus. To do this, they extracted selective DNA found in the lateral hypothalamus. They cloned this DNA and studied it under electron microscopy. Neurotransmitters found in this area were oddly similar to the gut hormone, secretin, so de Lecea decided to name the two forms of peptides hypocretin-1 and hypocretin-2. These cells were first thought to reside and work only within the lateral hypothalamus area, but immunocytochemistry tactics revealed the various projections this area truly had to other parts of the brain. A majority of these projections reached the limbic system and structures associated with it (including the amygdala, septum, and basal forebrain area). The history of the discovery of the orexin system is reflected in its nomenclature. "Hypocretin" refers to the gene or genetic products and "orexin" refers to the protein, reflecting the differing approaches that resulted in its discovery. The use of both terms is also a practical necessity because "HCRT" is the standard gene symbol in databases like GenBank and "OX" is used to refer to the pharmacology of the peptide system by the International Union of Basic and Clinical Pharmacology. Orexinergic neurons have been shown to be sensitive to inputs from Group III metabotropic glutamate receptors, cannabinoid receptor 1 and CB1–OX1 receptor heterodimers, adenosine A1 receptors, muscarinic M3 receptors, serotonin 5-HT1A receptors, neuropeptide Y receptors, cholecystokinin A receptors, and catecholamines, as well as to ghrelin, leptin, and glucose. Orexinergic neurons themselves regulate release of acetylcholine, serotonin and noradrenaline. 1 2 Davis JF, Choi DL, Benoit SC (2011). "24. Orexigenic Hypothalamic Peptides Behavior and Feeding - 24.5 Orexin". In Preedy VR, Watson RR, Martin CR. Handbook of Behavior, Food and Nutrition. Springer. pp. 361–2. ISBN 9780387922713. ↑ Marcus JN, Elmquist JK (2006). "3. Orexin Projections and Localization of Orexin Receptors". In Nishino S, Sakurai T. The Orexin/Hypocretin System: Physiology and Pathophysiology. Springer. p. 195. ISBN 9781592599509. 1 2 Sakurai T, Amemiya A, Ishii M, Matsuzaki I, Chemelli RM, Tanaka H, Williams SC, Richardson JA, Kozlowski GP, Wilson S, Arch JR, Buckingham RE, Haynes AC, Carr SA, Annan RS, McNulty DE, Liu WS, Terrett JA, Elshourbagy NA, Bergsma DJ, Yanagisawa M (Feb 1998). "Orexins and orexin receptors: a family of hypothalamic neuropeptides and G protein-coupled receptors that regulate feeding behavior". Cell. 92 (4): 573–85. doi:10.1016/S0092-8674(00)80949-6. PMID 9491897. 1 2 de Lecea L, Kilduff TS, Peyron C, Gao X, Foye PE, Danielson PE, Fukuhara C, Battenberg EL, Gautvik VT, Bartlett FS, Frankel WN, van den Pol AN, Bloom FE, Gautvik KM, Sutcliffe JG (Jan 1998). "The hypocretins: hypothalamus-specific peptides with neuroexcitatory activity". Proceedings of the National Academy of Sciences of the United States of America. 95 (1): 322–7. doi:10.1073/pnas.95.1.322. PMC 18213 . PMID 9419374. 1 2 Gotter AL, Webber AL, Coleman PJ, Renger JJ, Winrow CJ (Jul 2012). "International Union of Basic and Clinical Pharmacology. LXXXVI. Orexin receptor function, nomenclature and pharmacology". Pharmacological Reviews. 64 (3): 389–420. doi:10.1124/pr.111.005546. PMID 22759794. ↑ Langmead CJ, Jerman JC, Brough SJ, Scott C, Porter RA, Herdon HJ (Jan 2004). "Characterisation of the binding of [3H]-SB-674042, a novel nonpeptide antagonist, to the human orexin-1 receptor". British Journal of Pharmacology. 141 (2): 340–6. doi:10.1038/sj.bjp.0705610. PMC 1574197 . PMID 14691055. ↑ Wong, K.K. ; Ng, S.Y. ; Lee, L.T. ; Ng, H.K. ; Chow, B.K. (2011). "Orexins and their receptors from fish to mammals: a comparative approach". General and comparative endocrinology. 171 (2): 124–130. doi:10.1016/j.ygcen.2011.01.001. PMID 21216246. 1 2 Sellayah D, Bharaj P, Sikder D (Oct 2011). "Orexin is required for brown adipose tissue development, differentiation, and function". Cell Metabolism. 14 (4): 478–90. doi:10.1016/j.cmet.2011.08.010. PMID 21982708. Lay summary – ScienceDaily. ↑ Sherin JE, Elmquist JK, Torrealba F, Saper CB (Jun 1998). "Innervation of histaminergic tuberomammillary neurons by GABAergic and galaninergic neurons in the ventrolateral preoptic nucleus of the rat". The Journal of Neuroscience. 18 (12): 4705–21. PMID 9614245. ↑ Lu J, Bjorkum AA, Xu M, Gaus SE, Shiromani PJ, Saper CB (Jun 2002). "Selective activation of the extended ventrolateral preoptic nucleus during rapid eye movement sleep". The Journal of Neuroscience. 22 (11): 4568–76. PMID 12040064. ↑ Lin L, Faraco J, Li R, Kadotani H, Rogers W, Lin X, Qiu X, de Jong PJ, Nishino S, Mignot E (Aug 1999). "The sleep disorder canine narcolepsy is caused by a mutation in the hypocretin (orexin) receptor 2 gene". Cell. 98 (3): 365–76. doi:10.1016/S0092-8674(00)81965-0. PMID 10458611. ↑ Chemelli RM, Willie JT, Sinton CM, Elmquist JK, Scammell T, Lee C, Richardson JA, Williams SC, Xiong Y, Kisanuki Y, Fitch TE, Nakazato M, Hammer RE, Saper CB, Yanagisawa M (Aug 1999). "Narcolepsy in orexin knockout mice: molecular genetics of sleep regulation". Cell. 98 (4): 437–51. doi:10.1016/S0092-8674(00)81973-X. PMID 10481909. ↑ Mochizuki T, Crocker A, McCormack S, Yanagisawa M, Sakurai T, Scammell TE (Jul 2004). "Behavioral state instability in orexin knock-out mice". The Journal of Neuroscience. 24 (28): 6291–300. doi:10.1523/JNEUROSCI.0586-04.2004. PMID 15254084. ↑ Alexis Madrigal (2007-12-28). "Snorting a Brain Chemical Could Replace Sleep". Wired News, Condé Nast. Retrieved 2008-02-05. ↑ Deadwyler SA, Porrino L, Siegel JM, Hampson RE (Dec 2007). "Systemic and nasal delivery of orexin-A (Hypocretin-1) reduces the effects of sleep deprivation on cognitive performance in nonhuman primates". The Journal of Neuroscience. 27 (52): 14239–47. doi:10.1523/JNEUROSCI.3878-07.2007. PMID 18160631. ↑ Klein J, Sato A (Sep 2000). "The HLA system. Second of two parts". The New England Journal of Medicine. 343 (11): 782–6. doi:10.1056/NEJM200009143431106. PMID 10984567. ↑ Hallmayer J, Faraco J, Lin L, Hesselson S, Winkelmann J, Kawashima M, Mayer G, Plazzi G, Nevsimalova S, Bourgin P, Hong SC, Hong SS, Honda Y, Honda M, Högl B, Longstreth WT, Montplaisir J, Kemlink D, Einen M, Chen J, Musone SL, Akana M, Miyagawa T, Duan J, Desautels A, Erhardt C, Hesla PE, Poli F, Frauscher B, Jeong JH, Lee SP, Ton TG, Kvale M, Kolesar L, Dobrovolná M, Nepom GT, Salomon D, Wichmann HE, Rouleau GA, Gieger C, Levinson DF, Gejman PV, Meitinger T, Young T, Peppard P, Tokunaga K, Kwok PY, Risch N, Mignot E (Jun 2009). "Narcolepsy is strongly associated with the T-cell receptor alpha locus". Nature Genetics. 41 (6): 708–11. doi:10.1038/ng.372. PMC 2803042 . PMID 19412176. ↑ "Narcolepsy is an autoimmune disorder, Stanford researcher says". EurekAlert. American Association for the Advancement of Science. 2009-05-03. Retrieved 2009-05-31. ↑ Baird JP, Choe A, Loveland JL, Beck J, Mahoney CE, Lord JS, Grigg LA (March 2009). "Orexin-A Hyperphagia: Hindbrain Participation in Consummatory Feeding Responses". Endocrinology. 150 (3): 1202–1206. doi:10.1210/en.2008-0293. PMC 2654731 . PMID 19008313. ↑ Ida T, Nakahara K, Katayama T, Murakami N, Nakazato M (1999-03-13). "Effect of lateral cerebroventricular injection of the appetite-stimulating neuropeptide, orexin and neuropeptide Y, on the various behavioral activities of rats". Brain Research. 821 (2): 526–529. doi:10.1016/S0006-8993(99)01131-2. PMID 10064841. ↑ Brisbare-Roch C, Dingemanse J, Koberstein R, Hoever P, Aissaoui H, Flores S, Mueller C, Nayler O, van Gerven J, de Haas S, Hess P, Qiu C, Buchmann S, Scherz M, Weller T, Fischli W, Clozel M, Jenck F (2007-01-28). "Promotion of sleep by targeting the orexin system in rats, dogs and humans". Nature Medicine. 13 (2): 150–155. doi:10.1038/nm1544. PMID 17259994. ↑ Sakurai, T (2007-02-14). "The neural circuit of orexin (hypocretin): maintaining sleep and wakefulness". Nature Reviews Neuroscience. 8 (3): 171–181. doi:10.1038/nrn2092. PMID 17299454. ↑ Inutsuka A, Yamanaka A (2013-03-06). "The physiological role of orexin/hypocretin neurons in the regulation of sleep/wakefulness and neuroendocrine functions". Frontiers in Endocrinology. 4 (18): 18. doi:10.3389/fendo.2013.00018. PMID 23508038. ↑ Ventura, Jeff, ed. (2014-08-31). "FDA approves new type of sleep drug, Belsomra". Food and Drug Administration (FDA). Retrieved 2015-10-31. ↑ "BELSOMRA® (suvorexant) C-IV". Belsomra. Retrieved 2015-10-31. ↑ Helen Puttick (2006-12-26). "Hope in fight against alcoholism". The Herald. ↑ Lawrence AJ, Cowen MS, Yang HJ, Chen F, Oldfield B (Jul 2006). "The orexin system regulates alcohol-seeking in rats". British Journal of Pharmacology. 148 (6): 752–9. doi:10.1038/sj.bjp.0706789. PMC 1617074 . PMID 16751790. ↑ Arias-Carrión O, Murillo-Rodriguez E, Xu M, Blanco-Centurion C, Drucker-Colín R, Shiromani PJ (Dec 2004). "Transplantation of hypocretin neurons into the pontine reticular formation: preliminary results" (PDF). Sleep. 27 (8): 1465–70. PMC 1201562 . PMID 15683135. ↑ "Blocking A Neuropeptide Receptor Decreases Nicotine Addiction". ScienceDaily LLC. 2008-12-01. Retrieved 2009-02-11. ↑ Skrzypski M, T Le T, Kaczmarek P, Pruszynska-Oszmalek E, Pietrzak P, Szczepankiewicz D, Kolodziejski PA, Sassek M, Arafat A, Wiedenmann B, Nowak KW, Strowski MZ (Jul 2011). "Orexin A stimulates glucose uptake, lipid accumulation and adiponectin secretion from 3T3-L1 adipocytes and isolated primary rat adipocytes". Diabetologia. 54 (7): 1841–52. doi:10.1007/s00125-011-2152-2. PMID 21505958. ↑ Blouin AM, Fried I, Wilson CL, Staba RJ, Behnke EJ, Lam HA, Maidment NT, Karlsson K, Lapierre JL, Siegel JM (2013). "Human hypocretin and melanin-concentrating hormone levels are linked to emotion and social interaction". Nature Communications. 4: 1547. doi:10.1038/ncomms2461. PMC 3595130 . PMID 23462990. Lay summary – Science Daily. 1 2 Gautvik KM, de Lecea L, Gautvik VT, Danielson PE, Tranque P, Dopazo A, Bloom FE, Sutcliffe JG (Aug 1996). "Overview of the most prevalent hypothalamus-specific mRNAs, as identified by directional tag PCR subtraction". Proceedings of the National Academy of Sciences of the United States of America. 93 (16): 8733–8. doi:10.1073/pnas.93.16.8733. PMC 38742 . PMID 8710940. ↑ Ebrahim IO, Howard RS, Kopelman MD, Sharief MK, Williams AJ (May 2002). "The hypocretin/orexin system". Journal of the Royal Society of Medicine. 95 (5): 227–30. PMC 1279673 . PMID 11983761. ↑ Acuna-Goycolea C, Li Y, Van Den Pol AN (Mar 2004). "Group III metabotropic glutamate receptors maintain tonic inhibition of excitatory synaptic input to hypocretin/orexin neurons". The Journal of Neuroscience. 24 (12): 3013–22. doi:10.1523/JNEUROSCI.5416-03.2004. PMID 15044540. ↑ Flores A, Maldonado R, Berrendero F (2013). "Cannabinoid-hypocretin cross-talk in the central nervous system: what we know so far". Frontiers in Neuroscience. 7: 256. doi:10.3389/fnins.2013.00256. PMC 3868890 . PMID 24391536. Direct CB1-HcrtR1 interaction was first proposed in 2003 (Hilairet et al., 2003). Indeed, a 100-fold increase in the potency of hypocretin-1 to activate the ERK signaling was observed when CB1 and HcrtR1 were co-expressed ... In this study, a higher potency of hypocretin-1 to regulate CB1-HcrtR1 heteromer compared with the HcrtR1-HcrtR1 homomer was reported (Ward et al., 2011b). These data provide unambiguous identification of CB1-HcrtR1 heteromerization, which has a substantial functional impact. ... The existence of a cross-talk between the hypocretinergic and endocannabinoid systems is strongly supported by their partially overlapping anatomical distribution and common role in several physiological and pathological processes. However, little is known about the mechanisms underlying this interaction. ↑ Thompson MD, Xhaard H, Sakurai T, Rainero I, Kukkonen JP (2014). "OX1 and OX2 orexin/hypocretin receptor pharmacogenetics". Frontiers in Neuroscience. 8: 57. doi:10.3389/fnins.2014.00057. PMC 4018553 . PMID 24834023. OX1–CB1 dimerization was suggested to strongly potentiate orexin receptor signaling, but a likely explanation for the signal potentiation is, instead, offered by the ability of OX1 receptor signaling to produce 2-arachidonoyl glycerol, a CB1 receptor ligand, and a subsequent co-signaling of the receptors (Haj-Dahmane and Shen, 2005; Turunen et al., 2012; Jäntti et al., 2013). However, this does not preclude dimerization. ↑ Jäntti MH, Mandrika I, Kukkonen JP (Mar 2014). "Human orexin/hypocretin receptors form constitutive homo- and heteromeric complexes with each other and with human CB1 cannabinoid receptors". Biochemical and Biophysical Research Communications. 445 (2): 486–90. doi:10.1016/j.bbrc.2014.02.026. PMID 24530395. Orexin receptor subtypes readily formed homo- and hetero(di)mers, as suggested by significant BRET signals. CB1 receptors formed homodimers, and they also heterodimerized with both orexin receptors. ... In conclusion, orexin receptors have a significant propensity to make homo- and heterodi-/oligomeric complexes. However, it is unclear whether this affects their signaling. As orexin receptors efficiently signal via endocannabinoid production to CB1 receptors, dimerization could be an effective way of forming signal complexes with optimal cannabinoid concentrations available for cannabinoid receptors. ↑ Liu ZW, Gao XB (Jan 2007). "Adenosine inhibits activity of hypocretin/orexin neurons by the A1 receptor in the lateral hypothalamus: a possible sleep-promoting effect". Journal of Neurophysiology. 97 (1): 837–48. doi:10.1152/jn.00873.2006. PMC 1783688 . PMID 17093123. ↑ Ohno K, Hondo M, Sakurai T (Mar 2008). "Cholinergic regulation of orexin/hypocretin neurons through M(3) muscarinic receptor in mice". Journal of Pharmacological Sciences. 106 (3): 485–91. doi:10.1254/jphs.FP0071986. PMID 18344611. ↑ Muraki Y, Yamanaka A, Tsujino N, Kilduff TS, Goto K, Sakurai T (Aug 2004). "Serotonergic regulation of the orexin/hypocretin neurons through the 5-HT1A receptor". The Journal of Neuroscience. 24 (32): 7159–66. doi:10.1523/JNEUROSCI.1027-04.2004. PMID 15306649. ↑ Fu LY, Acuna-Goycolea C, van den Pol AN (Oct 2004). "Neuropeptide Y inhibits hypocretin/orexin neurons by multiple presynaptic and postsynaptic mechanisms: tonic depression of the hypothalamic arousal system". The Journal of Neuroscience. 24 (40): 8741–51. doi:10.1523/JNEUROSCI.2268-04.2004. PMID 15470140. ↑ Tsujino N, Yamanaka A, Ichiki K, Muraki Y, Kilduff TS, Yagami K, Takahashi S, Goto K, Sakurai T (Aug 2005). "Cholecystokinin activates orexin/hypocretin neurons through the cholecystokinin A receptor". The Journal of Neuroscience. 25 (32): 7459–69. doi:10.1523/JNEUROSCI.1193-05.2005. PMID 16093397. ↑ Li Y, van den Pol AN (Jan 2005). "Direct and indirect inhibition by catecholamines of hypocretin/orexin neurons". The Journal of Neuroscience. 25 (1): 173–83. doi:10.1523/JNEUROSCI.4015-04.2005. PMID 15634779. ↑ Yamanaka A, Muraki Y, Ichiki K, Tsujino N, Kilduff TS, Goto K, Sakurai T (Jul 2006). "Orexin neurons are directly and indirectly regulated by catecholamines in a complex manner". Journal of Neurophysiology. 96 (1): 284–98. doi:10.1152/jn.01361.2005. PMID 16611835. ↑ Ohno K, Sakurai T (Jan 2008). "Orexin neuronal circuitry: role in the regulation of sleep and wakefulness". Frontiers in Neuroendocrinology. 29 (1): 70–87. doi:10.1016/j.yfrne.2007.08.001. PMID 17910982. ↑ Bernard R, Lydic R, Baghdoyan HA (Oct 2003). "Hypocretin-1 causes G protein activation and increases ACh release in rat pons". The European Journal of Neuroscience. 18 (7): 1775–85. doi:10.1046/j.1460-9568.2003.02905.x. PMID 14622212. ↑ Frederick-Duus D, Guyton MF, Fadel J (Nov 2007). "Food-elicited increases in cortical acetylcholine release require orexin transmission". Neuroscience. 149 (3): 499–507. doi:10.1016/j.neuroscience.2007.07.061. PMID 17928158. ↑ Soffin EM, Gill CH, Brough SJ, Jerman JC, Davies CH (Jun 2004). "Pharmacological characterisation of the orexin receptor subtype mediating postsynaptic excitation in the rat dorsal raphe nucleus". Neuropharmacology. 46 (8): 1168–76. doi:10.1016/j.neuropharm.2004.02.014. PMID 15111023.